Your holiday dinners won’t be complete without a perfect Prime Rib at the center of the table. 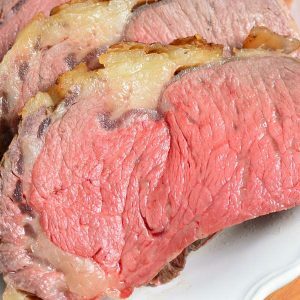 Prime Rib can also be called standing rib roast and I’m sharing my method for cooking it by slow roasting in the oven. Simply seasoned with salt and pepper, this steak lets its flavors shine and it is served with Red Wine Au Jus for dipping. There are many main dish choices for holidays, so make sure to check out my Orange Honey Ham and Garlic Pork Loin when making your dinner plans. Wondering what is prime rib anyway? It’s a cut of meat that comes from the primal rib area and can be as small as 2 ribs or as big as 7 ribs. 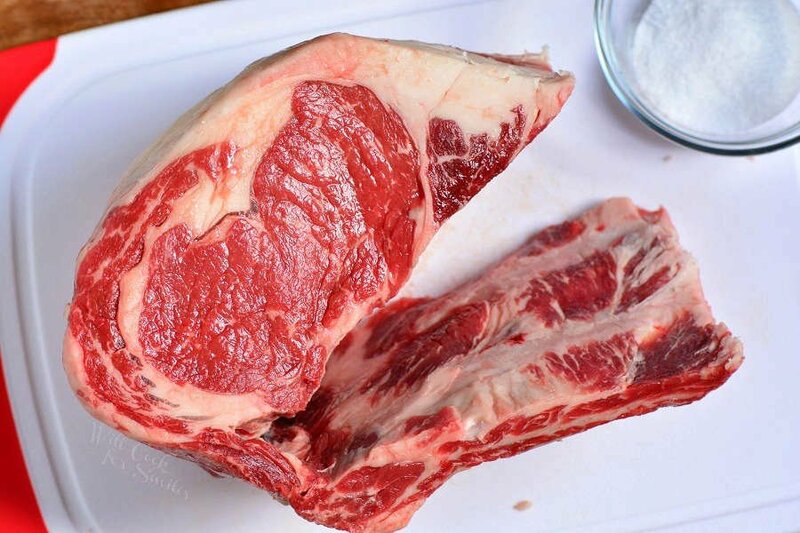 The meat cut that is attached to the rib is actually the ribeye steak. So next time you order a ribeye, that is the cut that came from the prime rib with bone and extra fat trimmed off. 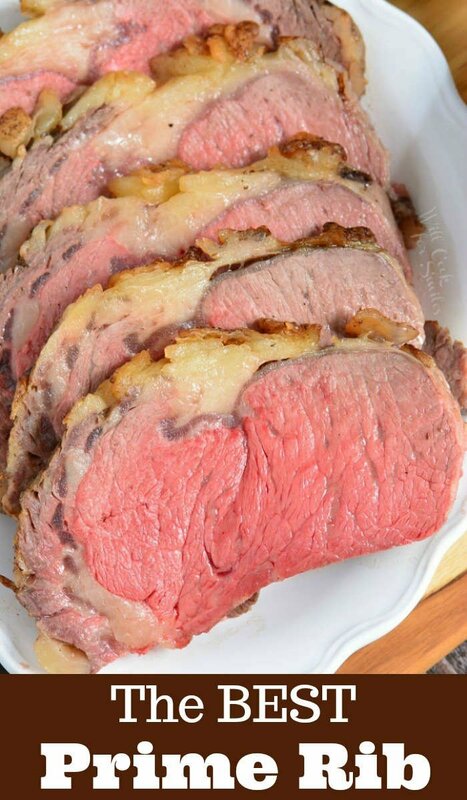 Prime rib is also known as the standing rib roast because it is cooked “standing” on the ribs. After the meat has been cooked and rested, the rob bones are removed before carving. 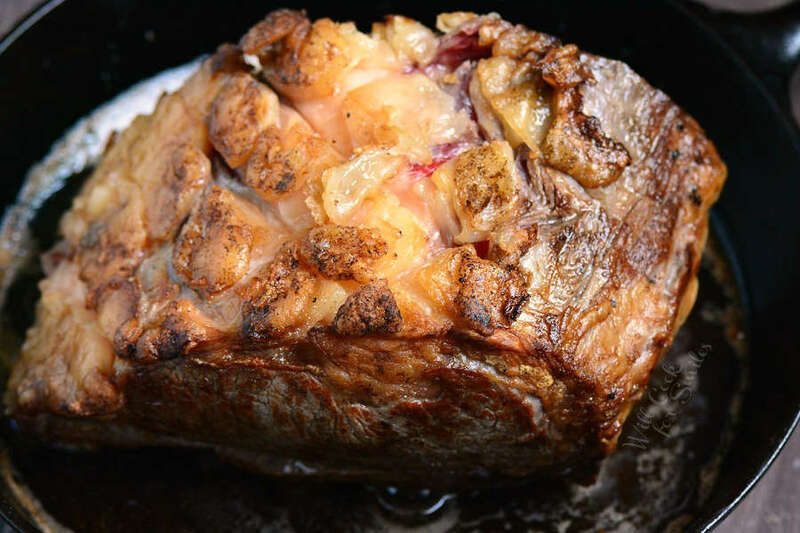 Prime Rib Roast is a beautiful holiday main dish because of how good this steak really is. 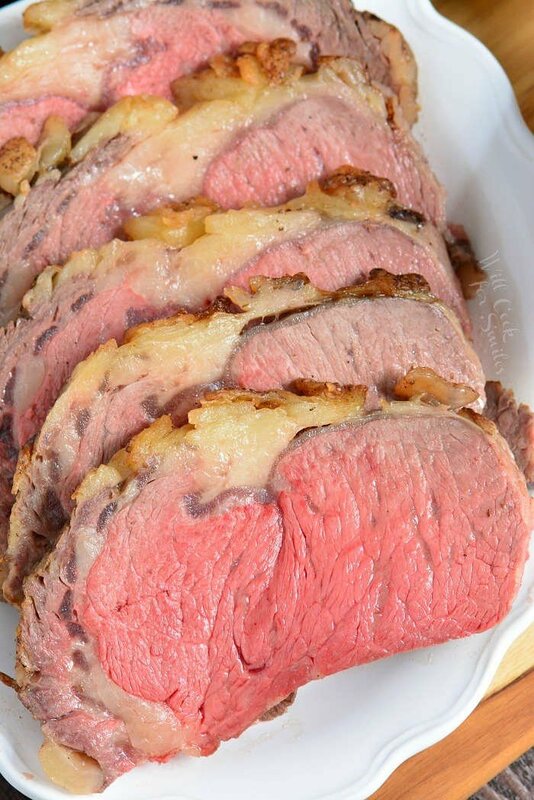 Not only that it’s soft and tender, prime rib is a great cut of meat. It’s called “prime” rib for a reason, because it comes from a Prime grade beef. When you’re choosing the meat, always remember that it will taste good as the the meat you choose. If your butcher asks if you want lean or fat trimmed off, remember that a lot of flavor and tenderness comes from meat being cooked with fat. Choose a cut that has great marbleization throughout. There are a few little things that I do to take the prime rib to the next level. 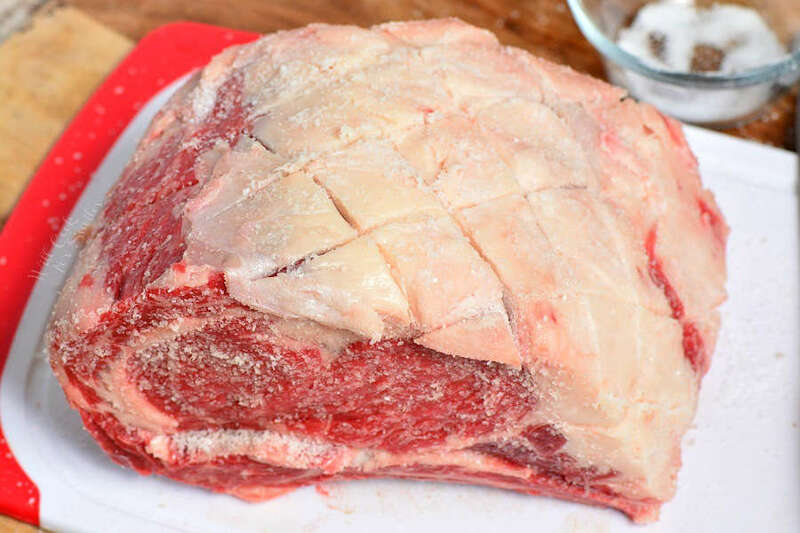 The day before cooking prime rib, you will need to salt it generously and let it sit in the refrigerator. You can ask the butcher to separate the rib from the meat and tie it back up or you can do it yourself at home. Score the fat cap on top by slicing it in a crisscross pattern. Generously rub the meat all over with coarse salt. Make sure to get in between the cuts in fat and on the side where the ribs separate from the meat. Place it on the plate, cover tightly with aluminum foil, and refrigerate overnight or up to 18 hours. Make sure to pull the meat out of the refrigerator 2-3 hours before cooking and let it get to room temperature. Just like on a good steak, I do simple with seasoning to let the meat shine. Simple salt and pepper is all that’s needed for a great piece of meat. Plus, there will be lots of flavor in au jus. Searing in the skillet, as opposed to blasting the meat with high heat in the oven, will expose meat to high heat fast. So the meat will get a great sear on the outside without starting to cook the meat on the inside. Leaving meat at 500° in the oven for 15-20 minutes will start to cook the meat inside. That’s why I always take the extra step of searing the meat separately. 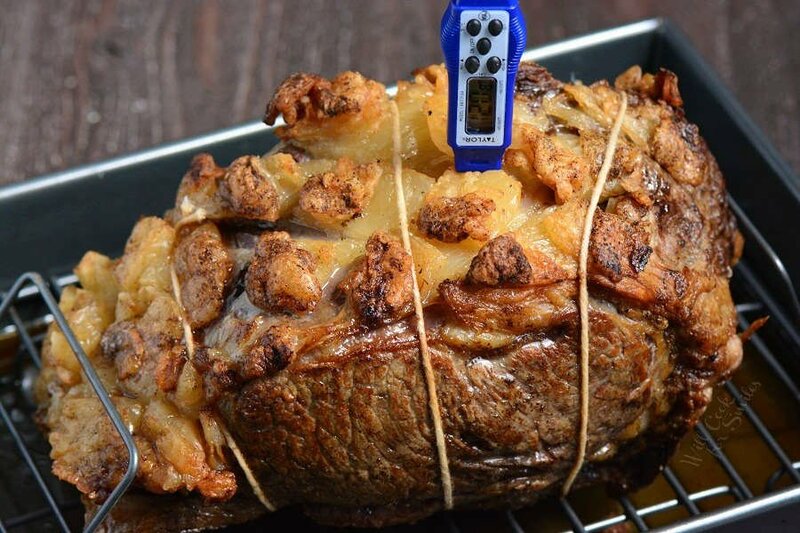 If you have a leave-in meat thermometer, it would be the best to use because you can read the internal temperature of the meat without opening the oven. If not, take the prime rib out of the oven to measure internal temperature and keep the oven closed. This will prevent temperature drops in the oven. Once the meat reached the temperature, take it out of the oven but do NOT cut into it yet. Place prime rib on the cutting board and tent it with aluminum foil. Let it rest for about 20 minutes. Remove the rib before slicing and slice prime rib against the grain, into steaks that are about 1/2 an inch thick. You can carve a little thicker or a little thinner depending on the dinner being served…and how much you love your guests. 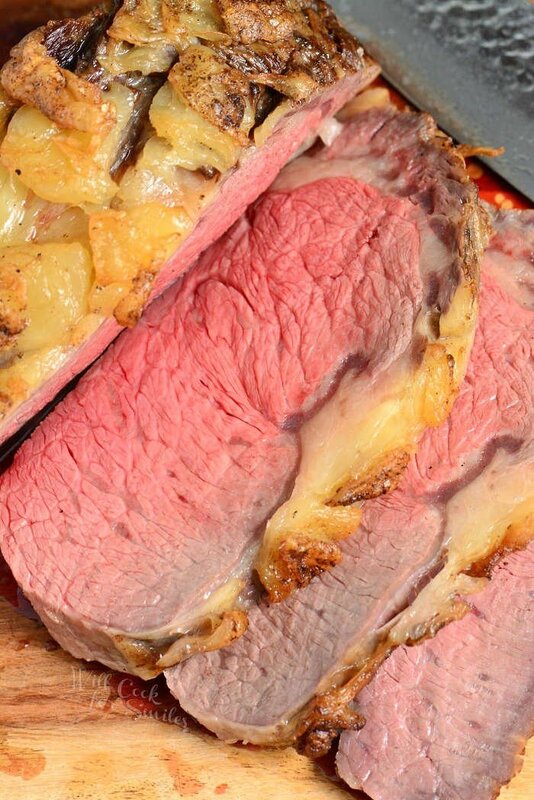 When getting prime rib, estimate 3/4 – 1 lb per person, depending on the type of dinner. For a large holiday dinner with many additional sides, 3/4 lb per person will be plenty. For a light family dinner, estimate 1 lb per person. You can carve thicker or thinner slices of steak as well, depending on the dinner. First things first, you will need some Red Wine Au Jus. 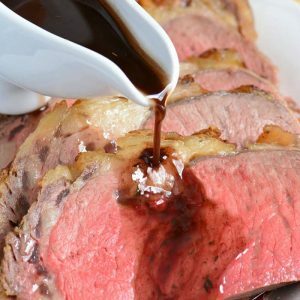 It is best prepared with dry wine, like Cabernet or Merlot, and make sure to use the drippings and juices accumulated from roasting prime rib. Roasted Mushrooms is a great side dish to go with beef. Classic vegetables like green beans and carrots also compliment beef nicely. Mashed potatoes is a wonderful comforting side dish that can also be topped with the same au jus or gravy that is used for prime rib. Roasted potatoes or smashed potatoes will make a delicious alternative to mashed potatoes. Holiday dinners won’t be complete without a perfect Prime Rib at the center of the table. Simply seasoned with salt and pepper, this steak lets the meat flavors shine and is served with Red Wine Au Jus for dipping. Separate the ribs from the meat. You can ask the butcher to separate the ribs from the meat and tie it back up or you can do it yourself at home. Score the fat cap on top by slicing it in a crisscross pattern. Generously rub the meat all over with coarse salt. Make sure to get in between the cuts in fat and on the side where the ribs separate from the meat. Place it on the plate, cover tightly with aluminum foil. and refrigerate overnight or up to 18 hours. Preheat oven to 250° and place a wire rack inside a roasting pan. Season prime rib with pepper on all sides. Transfer prime rib into the prepared roasting pan. (Is you have a leave-in meat thermometer, insert it into the thickest part of the meat.) Place the roast into the oven. My 4.5 lb roast took about 2 hours and 15 minutes to get to the temperature. It's hard to give an exact time because thickness of roasts does vary and therefore, relying on the time in not the best indicator of doneness. Thermometer is the best way to tell if your meat is done. TIP: If you do not have a leave-in thermometer, take the prime rib out of the oven to measure internal temperature and close the oven. This will prevent temperature drops in the oven. Once the meat reached the temperature, take it out of the oven and place it on the cutting board. Tent it with aluminum foil and let it rest for about 20 minutes. Remove the rib before slicing and carve the prime rib against the grain, into steaks that are about 1/2 an inch thick. 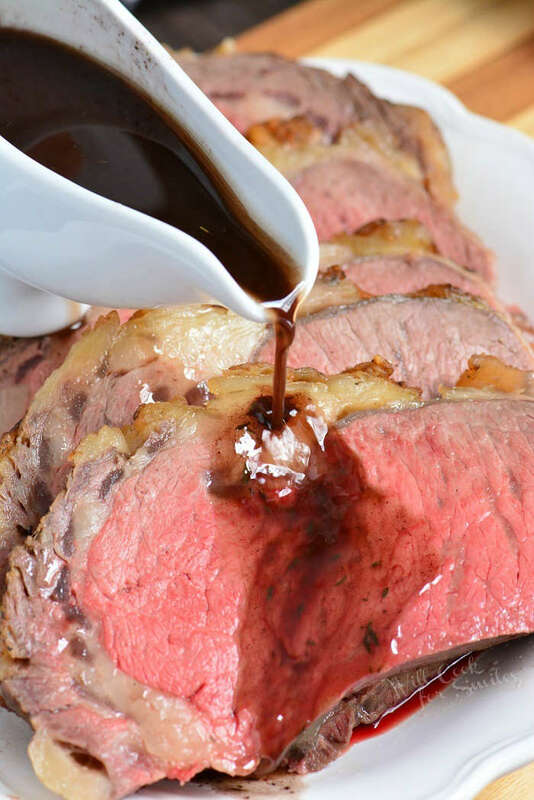 This delicious au jus made with dry red wine is a perfect complement to prime rib. 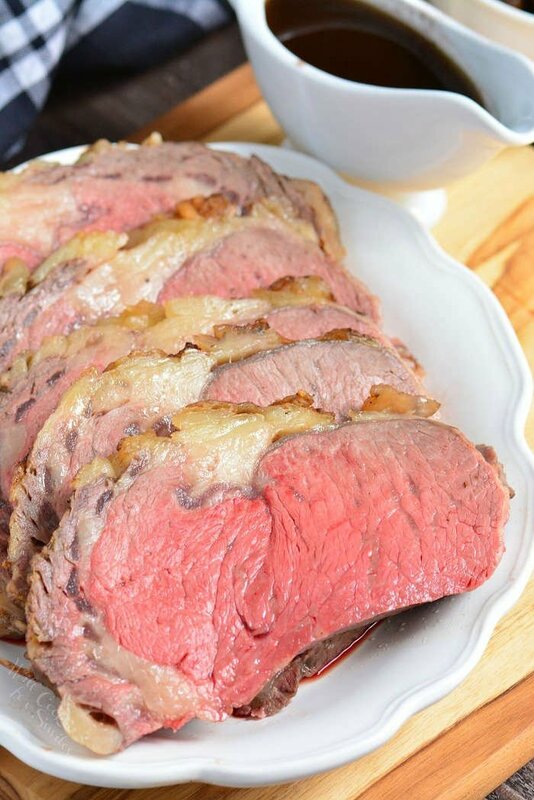 You can prepare au jus while prime rib is resting. I do not like to use the same roasting pan to cook au jus because it's hard to cook in a rectangle roasting pan over circular burner evenly. But, we still need to get all those great drippings out of the roasting pan. Add wine to the roasting pan, to deglaze and lift all the meat drippings. Use a wood spatula to scrape the bottom of the roasting pan and lift all the drippings from all parts of the pan. Pour everything from the roasting pan into the preheated cooking pan. Add beef stock, garlic powder, thyme, salt, and pepper. Bring it to simmer and let it simmer for about 15-20 minutes, until about half of the mixture is cooked out. Stir once in a while. You can portion au jus into individual remekins for servings.